Art and I have joked that the three women on our board remind us of the Tina Fey movie “Mean Girls.” I don’t know if the analogy is apropos because I’ve never seen the movie. I gather it is about popular girls making life miserable for kids who aren’t cool like, for instance, Art Johnston. If the analogy holds I would have to add that Annie and Rosie seem an unlikely pair to finish off Chair Seliga-Punyko’s sorority. The last post is the first one in nine years to have mentioned the name of my college fraternity, Phi Delta Theta. This is the second. Searching the blog I only found two mentions of the phrase “my fraternity” in previous posts. One is unflattering the other harmless. I spent four years with some of my brothers and have complicated thoughts about my time with them – too complicated for a simple post or two. Short posts are easy. Long ones take work. When I have something I want to say well I often fail to do so because I crank them out and then fail to edit them because of time. That was the case the day after my Mother died in December. I wrote a 2,500-word post that contained all the information I would need to have a splendid little memory but when I read it last week saw how rough it was. I had thought about sharing it with my Mother’s friends but even the hour I took to start editing it was not nearly enough. The reason I looked at it again was the fruition of long talks with my brother about putting her next to Dad in Mankato’s Woodland Hills Cemetery. Somewhere in the files I’ve preserved over forty years is the reading I cranked out a day or two after my Dad died. (One of the reasons I am so eager to have a proper place to organize and store forty years-worth of memories. Maybe I’ll also find the remembrance he wrote the year before to read at my Grandmother’s memorial. On that occasion 27 years ago I headed up to Mankato State’s library and hopped on a Mac computer and cranked out about seven pages of text only to have the computer seize up with about ten minutes left before the library kicked me out just before I got the chance to print it out. The 500 folks per day who visited during my silence were most likely showed up to read updated MAJ posts. They will come. They really will, but I’ve got other things to do. Yesterday I spent four hours with Claudia painting a Sunday school room at Glen Avon Church. 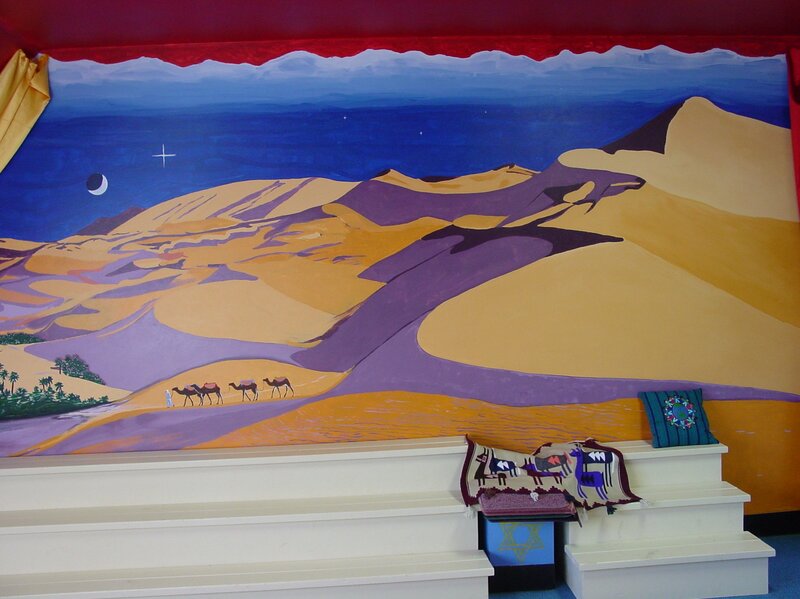 Its in a room that my church asked me to paint a mural in many years ago. I painted a desert scene from a red tent which was a popular book from that Era). 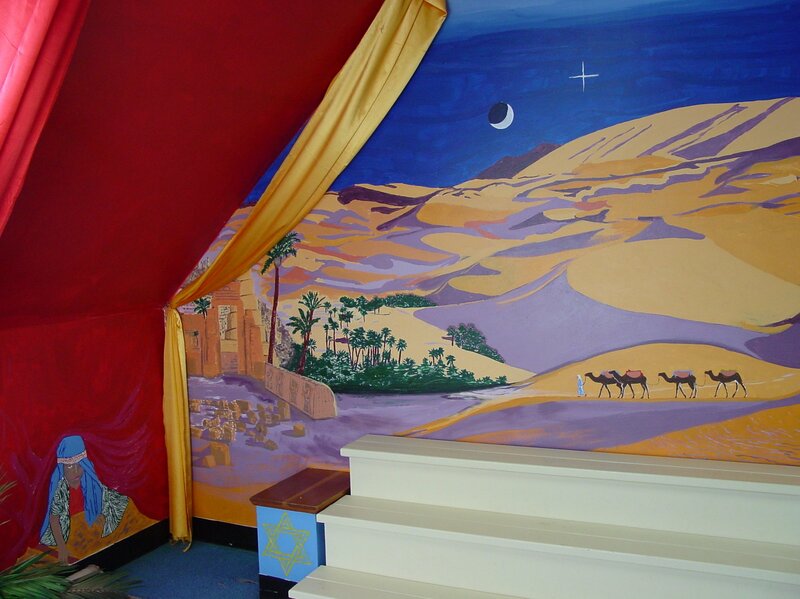 BTW – when I painted it I had no idea what the import of the Red Tent was. It turns out that its not exactly what I think of as Sunday School material. We didn’t paint over the mural just the rest of the wall that needed a fresh coat. The wooden risers have since been removed. Claudia tells me they were too precarious for the kids so the mural stretches again to the floor. Last night I attended one of the first “Think Kid’s” meetings with a paltry 24 parents in attendance at the active parent school Congdon. Today I woke to discover that Superintendent Gronseth is a finalist for a position in Prior Lake. Golly, Such a lot to take in and opine about. Oh yeah, and Loren Martell quoted me in his Friday column that I missed when I drove down to Mankato. So I’ve got MAJ, Martell, Mankato, Makeup posts and much much more ahead of me. That’s a lot even for a bloviator like me. As I get around to them I’ll start denoting some posts as MAJ meaning the Martyrdom of Art Johnston. NOTE: this addition posted on Friday, March 27th. To say I’ve been busy the last few days is an understatement. I have written some rough drafts of MAJ posts yet to come but I’m not content to write and post anything too hastily or carelessly. My horizon is the November election. At the moment I’ve got a lot on my plate not the least of which is a major home improvement project for which I have made half my house uninhabitable. The previous post is not finished to my satisfaction so I’m just keeping it until I get back from a weekend out of Duluth. I’m going solo. The post to follow it, tentatively titled “Mean Girls,” will follow. My brother and I will be attending a college reunion in Mankato this weekend. I’m hopping in the car in about ten minutes. The reunion will give us a chance to place our Mother’s earthly remains besides those of our Father. Sometimes immediate concerns (like my focus on the Duluth Schools) have to take a backseat. I’m sorry for the recent spate of mangled and incomplete posts. I’ll fix them up when I find time in a few days. Last week as I was rummaging through a file cabinet of family memorabilia I opened up a folder about my son. Inside were pictures of all his classmates from second grade. One smiling young lady with long golden hair is now my colleague on the Duluth School Board, Annie Harala. If ever I was primed to look forward to a new colleague it was surely Annie. She asked me if I remembered the incident with the lamb eyeballs. How could I forget? A few years back when my son, Robb, decided washing dishes wasn’t a mentally challenging enough career path he began taking classes at Lake Superior College. In short order he began thinking about becoming and EMT (Emergency Medical Technician). Because of the lamb eyeballs I was skeptical about this and a later higher trajectory ambition of his to become a doctor. I just wasn’t sure he was ready for blood and guts. Annie and Robb both had Mrs. Lemons in their second grade class at Chester Park. Mrs. Lemons, who had also taught Robb’s older sister had some connection with folks in animal husbandry (farming). One day she brought a bucket of lamb eyeballs into her class for educational purposes or maybe Easter. We got an anxious call from the school that day. As soon as Robb got a gander at the eyeballs staring back at him he was out like a light. It didn’t bother any of the other kids. Like Annie it gave them a fun reminiscence and me some concern that my son was pursuing the wrong job. Annie easily came out on top in the at large race for school board when I finally ran again in 2013. That was easy to anticipate, far easier than my second place finish. Annie wasted little time stretching her arms. From day one she asked probing questions, was business-like and had an intuitive feel for the job. I’ve been teaching and poking around the schools for forty years but I’ve missed out on lots of history since I stepped off the Board in 2004. For all these voids in my experience Annie has an easy command. Of all the chairmen of committees Annie is the most natural leader. If I were to fault her for anything it is in being too sensitive about the other board member’s distaste for Art Johnston. She often artlessly parrots the other board members when they try to get Art to stop commenting on any subject that he is concerned about. This almost always guarantees a much longer discussion. This almost happened at last night’s school board meeting. When WADM’s came up and Art’s light went on Mike Miernicki, who now sits beside me, let loose a loud distraught exhalation before plunging his head into his hands. Then, no doubt to Mike’s amazement, Art simply noted pleasantly that he was glad to see our student enrollment had ticked up by fifteen students. This is Mike’s kneejerk reaction to Art’s every comment. It didn’t take long for the other board members to inculcate Annie with their phobic allergy. In particular Judy Seliga-Punyko gathered the three female board members around her. From the beginning I saw them huddled in conferences after every meeting out by the parking lot. It was coalition building; a natural part of the political process. I can only imagine what stories Judy told her new colleagues. I got the same from Art as I became his first ally in two years. There is one other coalition between Mike Miernicki and Bill Westholm that that goes back to their days as students in Denfeld High School. I had not anticipated the immediate coalition that formed between Annie, Rosie and Judy. I knew that Rosie and Judy had natural antagonisms going back to my earlier service on the Board. I also knew that Rosie had served in a position that was in some respects more exalted when she served as the president of the Minnesota State Parent, Teacher, Student Assn. (PTSA) Rosie had preceded Judy as the President of the Duluth PTSA, where the original antagonism surfaced. I would have thought this formidable background would have made Rosie a little less Judy’s follower than she quickly seemed to become. You would never have known that Art had once urged Rosie to run for the School Board. These alliances were less obvious in the first three months after we were seated. That’s partly because I told Art that we should back off asking questions about things like Red Plan soft costs for several months in order to build up some trust. We had bright sunny meetings during that all too brief period. That ended once we began asking questions. The three coalitions congealed into two – five board members to two. One moment in our first month on the Board aptly illustrates the paths we were taking. The Minnesota School Board Association has its annual conference in January at the Minneapolis Convention Center. I drove down with Art in his car in snowy weather with his wipers on the blink. I spent a fair amount of my time hanging out his car window with a long scraper keeping the windows free of snow so we could see ahead. I returned with Mike and Bill which (fodder for future posts) because Art was planning to visit one of his children after the conference. I left the conference before its final gathering because Mike and Bill wanted to get an early start home. That left four of us behind. When he returned from the convention Art described the pivotal scene for me. Art was in the convention hall waiting for his fellow board members to arrive so as to sit with them. Judy Seliga-Punyko strode into the Center’s ballroom first and walked right past Art without turning her head in his direction. Judy was followed by Rosie who, emulating the leader, also walked past Art without turning her head. Right behind them followed Annie whose heart was not yet turned to stone. Annie didn’t break her stride as she kept up her elders but she did turn toward Art looking resigned and gave Art an apologetic shrug. The die was cast. Young Annie Harala asked one question of District officials at our closed meeting yesterday. Were the students subject to expulsion remorseful for their actions. I’ll only say that the response was what the person putting such a question might hope for. It is the second time Annie Harala has asked this question in my hearing. The first was at the meeting in which she joined the majority to vote for a hearing that would preceed Art Johnston’s removal from the Duluth School Board. She asked attorney, Mary Rice, if at any time Art Johnston has expressed remorse for shoving the Superintendent for which she was virtually the sole witness. The answer did not satisfy Ms. Harala. Of course, if Art believed that he did not shove the Superintendent he should not be expected to be remorseful. I’m close to describing the particulars leading up to Art’s antics and they will portray a very different picture which I was unable to divulge to the rest of the Board because of the damned laws on data privacy. Some months ago I did share a more candid description of these mitigating actions with Annie in writing but my explanation obviously failed to change her mind. Annie is the primary reason that the Board has an excuse to remove Art Johnston. Had she detected remorse in him she might have relented. She did not. As a result we are about to go to court and the reputation of the School Board has been unmercifully sullied and our supervision over our children’s schools deeply unsettled. I would turn the question on Annie. Is she felling any remorse for the part she played in letting these events get out of control? I don’t know but like her I’d like to think she is suffering some remorse whether she admits to to it or not. This post and the next will reference small interactions that too place in the closed session but which, in my estimation, do not give away anything related to data privacy. Member Rosie Loeffler-Kemp spoke earnestly about the need to keep the meetings discussion confidential. She has done this in other closed sessions almost always with a furtive nod in my direction which I have taken as accusatory and very particularly directed at me. Not tonight. It came out pro forma like something an official is always expected to say much like accountants always quote that paragraph in their audits about its being in compliance with official accounting standards. Just before the meeting as I was heading in the parking lot Rosie passed me in her car going the opposite direction. She saw me and smiled pleasantly and gave me a wave which I reciprocated. Readers will note that this was quite different than the last time we had eye contact and Rosie was still smarting over my comments about the young African American who attended the conference on citizen involvement. If the School Board wasn’t about to dive full fledged into a courtroom again I’d take these as an excellent sign that we could go back to square one. Alas this is not to be. Since Art Johnston’s character has come under so much scrutiny I feel compelled to honor the sage old adage what’s sauce for the goose is sauce for the gander. For a long time I’ve thought that the only Board member that would escape terribly hard scrutiny in my evaluations would be the youngest member Annie Harala. But no. Even Annie will be subject to my more rigorous scrutiny. I left a phone message with Annie asking that she call me back in the hopes that we could still find one more way to escape the coming legal assault. She did not return my call. Neither, of course, did the Superintendent. Rosie’s demeanor yesterday suggested to me what might have been an opening to resolve our differences. We have not made that step. Once again I say Damn us, Damn me. I can’t say much more about our closed meeting yesterday than the Duluth News Tribune reported. The School Board expelled two students as the story says. It follows on the heals of a troubling incident that made the front page of the Trib several days running. Draw any connection you wish. I will say that the school board asked almost every question that I think the public is asking. By virtue of being Board members we had our questions answered. We were concerned with justice. For my part I mentioned that in the early days of plane hijacking people in airports who joked about hijacking a plane were carted off. We were concerned that there be some redemption possible. Our school leaders assured us that restorative justice would be employed. That’s something I’ve been enthusiastic about for a number of years although I’m not convinced we are as well practiced in it in ISD 709 as we should be. The School Board unanimously agreed with the Administration’s response and went in to vote on our public resolution to accept the expulsions described. The Denfeld band was setting up to give us a little Music in the Schools concert so we shooed them out for five minutes to keep them uncontaminated from the unpleasantness. Whatever our failings that may have helped lead up to tonight I think we acquitted ourselves well this night. I’ve spent a lot of time over the past ten years cleaning out my attic. The plan has been to turn it into an office where I can put my vast quantity of files and books for easy retrieval. It was only last year that I finally wore down my better half who has always planned to throw everything of mine away. 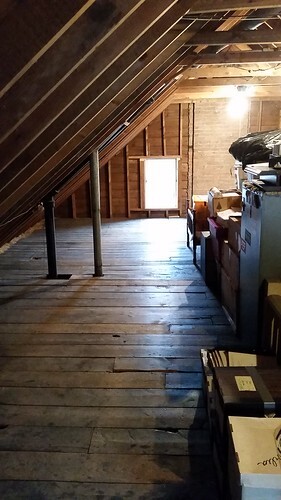 Well, this is the attic as it was just before the project began. Note, I still had a huge stack of stuff in the center that I had no room to take to the rest of the house. The contractors have had to shuffle it around to blow in insulation and hang sheetrock. The work is going very fast and I’m looking forward to having it ready to paint in a week or two. Organizing it will take a month or more. My blogging sometimes suffers from other preoccupations. Yesterday I couldn’t get past a growing pile in my claustrophobic current office. I did start the day by ironing eight or nine shirts while watching the fifth episode of HBO’s Newsroom. And when the contractors cleared out I spent two hours vacuuming the house. Its the least I can do since I’ve inflicted the mess on my reluctant spouse. In between I just couldn’t get worked up to post any blog material. As for the weekend…..that was reserved for my family. I took my grandson’s hiking in Oregon Creek. 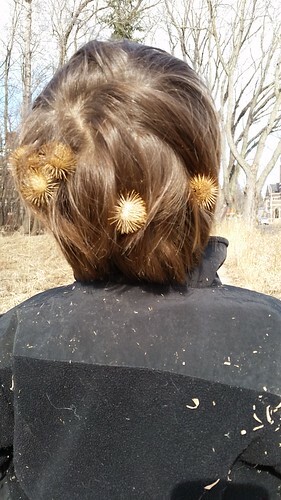 They both looked good in burrs but didn’t like having me remove them. I feel the same way about my school board. I woke up today at 2:30 with the free press on my mind. After a couple hours of tossing and turning I gave in and wrote a 1600 word post on the subject just to get it out of my head. I’m unresolved whether to edit it and stick it in the blog. I never did find the energy or time to edit the two posts I promised to improve upon from last week. I spent the time vacuuming instead. I cranked out the two previous posts last night in about two hours and went back to bed certain that I needed to return to them for proof reading. I’ll get to that proofing sometime this afternoon but for now I’ve got my fingers crossed that I didn’t make too big a hash of my story telling in the first go round. Editing will good work for me as the new crew of foam insulators tromps around up above me in my attic. Having just donated a pint of blood I’m supposed to avoid hard physical labor today. Serving lunch at the Damiano shouldn’t violate that. I did pick up the latest Duluth Reader on my way to Memorial Blood Bank. Loren Martell has a good and much more detailed analysis of Art Johnston’s legal maneuvering than I’ve provided to date. I still have to print out the 67 page legal brief Art mailed me. My Mom always told me that it takes two to make a fight and our school board is no exception. We are all to blame for turning our backs on Duluth’s children to fight for the Constitution or for the enforcement of lip zipping. Gosh, I think I’ve given away my prejudices. I should just have said its a David and Goliath battle – justice vs. power – and we all, along with our children, will be the losers no matter its outcome. …at midnight on the first day of Spring. I’ve not had many idle hours since returning from Florida Disney’s fantasy land to the nightmare before Spring in Duluth. Today will be busy too. I donate blood at 8 AM then serve lunch at eleven at the Damiano Center. Hopefully the new crew of foam insulators will arrive while I’m away and take up with a bigger machine from the job that was a tad beyond that of the first crew this week. Hopefully between errands I’ll be able to pick up the small habitable space in my current office and do some serious writing. Yesterday was busy too. I vacuumed the heck out of the floors several times to remove particles of insulation. Some of that work was to tidy up before a cleaning crew came in at noon and cleaned up the rooms in the house that weren’t full of the stuff I cleared out of the attic. Then I helped some teamsters haul fifty four-by-eight sheet rock panels up to my attic. Then I poured through a thousand or more old emails in a desperate attempt to free up my email system which is so overgrown with ancient email it barely works. I had gotten up early to post two emails regarding an acquaintance that was discussing the issue of effective school size. I gave her a little grief with my tsk tsking about her comment that I get myself educated on the latest research and she sent me a lol to let me know we were still friends. I wrote back that I liked showing the public how grownups could have a serious conversation something missing from my interactions with the Duluth School Board majority. The lunch room of the old Lincoln had a crowd of over a hundred people when I arrived late because I thought the meeting was being held at the new Lincoln Middle School. I’d judge that at least a quarter of the folks in attendance were from the minority community. We were exhorted to behave in a civil way with a list of dos and don’ts that emphasized sympathetic listening rather than the Civility Project’s Minnesota Nice approach to discussions. Then the one hundred were broken up into quartiles and my group headed to a noisy corner of the cafe. Again my answer sare inserted in your email. Great Question and I wish I’d thought to ask it although there were no facility experts at the meeting to answer it. I presumed the chart’s numbers only reflected classroom capacity. In the Congdon School case I did the math and asked if the maximum student capacity listed, 675, matched the number of classrooms 27 that would be possible if you presumed there were no small special ed, ECFE, Headstart classes etc. The Congdon principal was there an confirmed that my calculation seemed correct to her so, I think in that case the numbers arrived at match the chart. Whether that’s true of the secondary schoolls I have no idea. ******, reading this I can only say it is a great shame you were not on the school board during the Red Plan fiasco. I guess the Red Plan’s much heralded State demographer’s report had some glaring errors. My thoughts are inserted in your email. After we spent $480 million on the Red Plan its too late to consider the best size for high schools in ISD 709. What we have is what we will continue to have. I don’t disagree with the enrollment recommendations you mention. I’ve always been appalled at the NY City model where their schools were huge and so soulless they were given numbers instead of names. But on the other hand I’m not a one kind fits all sort of fellow. I’m prepared to make what we have work as well as it can and believe the human touch, given a chance, can overcome all sorts of facility disadvantages including size. I agree that Edison’s size will be a draw but it will also not be able to offer what the ISD 709 schools do because of financial constraints. Our schools will become necessarily smaller with an Edison school in the vicinity but that will have more negative initial impacts than positive ones. Why? Because smaller students mean a smaller faculty and more limited course offerings – And Because maintenance costs will increase as we have more empty space (the primary justification for building the Red Plan in the first place) – And because we will find ourselves losing some of our more stable students leaving a little more concentrated free and reduced lunch population in our schools with attendant consequences – And because as our teachers fall under more stress trying to match Edison’s zeal it will become harder and harder to live one day at a time. What’s happening now at Denfeld will surely accelerate. As for abandoning Denfeld that is no more a practical option than it was ten years ago – at least for a while. And I agree about the size issue. I opposed a single school for two reasons. First because I didn’t think it would fly politically and second because one huge school would have had the effect of turning kids into numbers. I may have been a little alarmist in this post owing to my frustration and my penchant for irony as in Look at the fine mess the Red Plan has left us with . That’s a point I grimly enjoy repeating ad nauseam. I see no great upside to the community as a whole in the creation of a new Edison High School and I expect to have two grandsons attending it. *******…tsk, tsk, tsk…isn’t that comment a touch patronizing? …that in addition to everything else on Monday while Art was lobbying in St. Paul I also was working on finishing up my Conservatorship over my Mother and working on my own rather complicated federal income taxes. I didn’t think I had. Then there is the packet of family history that my Aunt Mary sent me and a call last night from a fellow who wants me to document my Grandfather’s life for a book. I’m very distracted but I always come back to the primary diver of my school board life……Keeping the District in good health despite stormy winds. Jana Hollingsworth put me at the end of her story today mentioning my questioning about whether the Demographers considered the “elephant in the room” – the possibility that our half billion gamble on the Red Plan could leave us with one unnecessary high school should Edison decide to build a high school and pull 600 kids out of our ISD 709 high schools. Except that the Trib’s chart is right and my memory is faulty. According to these figures we have a Red Plan theorized capacity of over 5,000 9-12 students. Heck. East Ordean has the capacity, according to this chart, for both East’s 1,500 and Denfeld’s 900 students. Subtract 600 students out of that total and all our kids will fit into Ordean East very comfortably. Just think of the savings if we went to one high school! That’s what one-high-school proponents argued at the beginning of the Long Range Facilities Planning process…….only they imagined them all being located at the Central High location. Imagine my chagrin. When I left the School Board in 2004 I did so without a fight because I had spent four or five years arguing that Duluth was a two high school town not a three high school town. I gave up on ever winning that argument. But Dr. Dixon managed to get it done……not my way – by saving a million by simply closing one high school – but by spending $480 million on rebuilding our entire school plant. So, we have two public high schools today with the possibility, if not likelihood, that Edison will add one more. We will be back to what I was fighting eleven years ago three unsustainable public high schools. Something will have to give. Maybe it will be Harbor City ….maybe it will be Marshall High…..maybe it will be Denfeld. Maybe it will be all or a couple of these high schools. No one can say that watching the Duluth Schools is boring. You must, however, have a high tolerance for antacid. By Art Johnston I mean – an attempt to remove a Board member on insufficient grounds. I had told Art that I would go down with him again on Monday this week to lobby for the Senate File 539 that would put an end to the 1858 wording that gives School Board’s authority to vote off a dissenting member for “proper cause.” I had too much going on to accompany Art but he called with good news. This Senate Bill now has a companion House Bill HF1962 to go along with it making it more possible for passage. Both bills have sponsors on both sides of the aisle. As Art and school board members from other stricken districts circulate they are finding a receptive audience among legislators. As Senator Terri Bonoff said during her testimony last week before the Senate subcommittee on elections, she couldn’t imagine that legislators would accept a system in which a group of legislators could remove another elected representative with so little fuss and bother. Elections should be close to sacred. So, now the law has found sponsors in the House. I don’t know whether the law will pass this year and frankly I’m a too preoccupied in Duluth with ISD 709 and personal projects to lobby weekly at the moment. Besides, the law can be pushed next session if it fails this time. I have been stockpiling blog posts in my mind for a week now. Several things conspired to interrupt their flow to the Internet. For one thing the ire of one Denfeld teacher gave me pause. I regretted that I publicly drew attention to one of two teachers who made themselves vulnerable by bringing forth the concerns of many other Denfeld teachers. I left my self flagellation for this on my blog to attone for this. But, as readers saw yesterday, my self criticism only extends so far. It does not extend to any other School Board member who takes it upon themselves to jump on the dog pile I started. 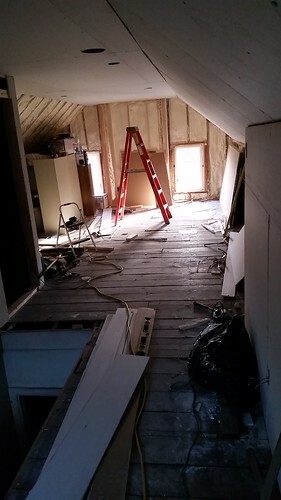 My other distraction is the renovation of my attic. At the moment I have its contents stuffed in my basement and in two bedrooms. Finding my old filed documents is difficult and workers are coming in and out of the house. We are in the middle of foaming insulation on the attic floor. Soon it will be sheet rocking. Its keeping me and my vacuum cleaner busy. The most important post for the day today (which I have yet to write) relates to the banner headline “Nevermind” on the front page of the News Tribune. For my literalist readers I suppose I have to explain that the nevermind is meant to be ironic. We were told a year and a half ago that our elementary schools were due for massive overcrowding. I will blogging things as they occur to me and not necessarily ranked in importance. That means in the layout of a blog that the first things will appear last as readers scroll down. That’s why I often leave a note in extended postings encouraging readers to go to the first in a succession of posts and read up. I won’t do that today. Most of my posts won’t be tied together in that kind of order. “So much for “Honesty is the Best Policy.” Thank you Mr. White. You are an excellent teacher and role model for our students. We do need to recognize that there are people who will use any negative to further their cause. Harry, I read your blog where you reported that I had students in his trigonometry class who didn’t know their multiplication tables.